"Rosacea is a chronic inflammatory chronic common skin condition that resembles acne. This benign skin problem, which causes the face to appear red can also cause other symptoms such as flushing, persistent redness, bumpiness, and uneven skin texture and dilated skin vessels. It can also cause burning, stinging and dull dry skin appearance. It affects about 16 million people in the US and about 45 million people worldwide. Most people who have rosacea also have fair skin, which appears to flush easily or blush when small blood vessels in the face dilate. Women in their 30s to 50s are more likely to have the condition. Many people who have rosacea are not aware of it and may think that their skin is just sensitive to the sun, while others may think they have acne. When not treated, symptoms can get more chronic over time. It is classified into four types. Although it is a chronic skin problem that may come and go, it is not contagious and it is easily diagnosed and managed with prescription medications and by improving the way you care for your skin at home. In most patients, the problem will be limited to the face. The exact cause has not been identified. We do know that blood vessels in the skin of people with rosacea become dilated easily. We also know that there are certain lifestyle and environmental triggers that are listed below such as stress, sun or wind or certain foods. Remember that with Rosacea it matters in terms of what you do and do not put on your skin so some experimentation may be needed to identify your personal triggers." Dr. Andrea Dray discusses Rosacea triggers, cures and skin care. This website was started after my personal quest to control my Rosacea. I suffered through years of having what appeared to be a red face, constant outbreaks, and pimples. At times the condition would flare up with the embarrassing red face color and pimple outbreaks that many who have this disease suffer through. I'm the guy in every family picture with the really red race. I used to blame stress or other unknown triggers. After years of experimentation, I finally found a method that at first controlled and then completely eliminated all signs of the condition. I am a 54-year-old man, so some of these techniques are specific to men, but the general principles apply to all. This is my personal experience. It is what worked for me and may or may not work for you. It is based on recommendations from multiple Doctors and friends and the thinking is based on sound principals. The biggest thing to learn is that you have to take care of your skin (to a guy this is news). Business as usual and prescription products alone will not control your Rosacea. I start in the morning by shaving with a self-cleaning electric shaver and occasionally use a blade. Shaving introduces harmful bacteria into the skin so the goal is to minimize cuts and keep bacteria away. If you use a blade, I suggest improving the quality of the products you use in order to cut down any nicks and cuts. I switched to the Art of Shaving system. You can get an Art of Shaving Starter Kit which lets you try the 4 step process (apply shaving oil, use the Art of Shaving cream applied with a brush, shave, then moisturize with the shaving balm) for under $20. My Doctor recommended that I add another step which is the application of an astringent right after shaving and before applying any prescription topicals and the moisturizer/shaving balm. My Doctor recommended Kiel's Blue Astringent Herbal Lotion. This might be the most important thing you do since it reduces oily areas and soothes the skin. I take the Keil's and pour it into a small spray bottle. Keil's isn't cheap, but it is worth it (buy a small bottle and give it a try for two to three weeks). For Women,I also suggest applying the Keil's to facial skin after showering. (note an astringent may not be tolerated by everyone with Rosacea, so try and it and see how your skin reacts. I believe it is an importatn part of the regimen). Spray it onto the skin, let it dry and then apply any prescription products such as Metrogel or Finacea (whatever your Doctor prescribed) followed by the moisturizer/shaving balm. If you use a razor blade, pat it dry with a towel. This step will allow the blade to last longer and stay sharper. Instead of shaving with a blade, I shifted most shaving to an electric self-cleaning razor. The self-cleaning option also cuts down on bacteria and the electric is less damaging to the face. I bought the Braun Series 7 790cc. It took a few times for my face to get used to the Electric, but now I get a great shave with no cuts or irritation! At night I wash the face using the Lush Kalamazoo Beard and Facial Wash (I don't have a beard). It is a natural product recommended by my Doctor that cleans and moisturizes. I never felt my skin so clean as when I use this product. I follow this by the application of my prescription Finacea. UPDATE: I have replaced the MetrogelTM and FinaceaTM with one prescription topical, soolantraTM. I have been using it for several weeks with no issues. If your skin is dry, you can apply a high quality moisturizer such as Cerave. Please use the comment form at the bottom of this page to let me know how this skin care regimen worked for you. The exact cause of rosacea is still unknown but studies suggest that it may have a genetic component because it tends to run in families. Other risk factors include overreaction of the immune system, H. pylori infection in the gut, presence of mites in the skin, sun-exposure, or changes in weather, menopause, and long-term treatment with steroids. Some things may also trigger flare-ups such as emotional stress, alcohol, hot or spicy foods, and heavy exercise. 10% of people with fair skin have the condition with the first signs appearing between age 30 and 50. 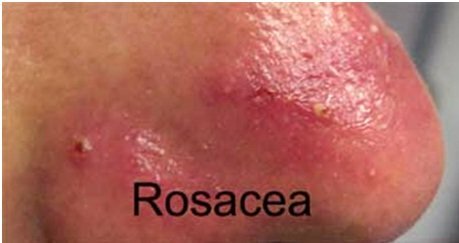 Acne may have preceded the first rosacea outbreak by several years, although the appearance of acne earlier in life is not necessary to get the condition later on. People can have their own personal triggers that cause the condition to flare-up such as stress or certain spicy foods or condiments. After a flare-up review foods and particularly condiments consumed the day before that may have caused the condition to worsen. Most Common Rosacea Triggers. 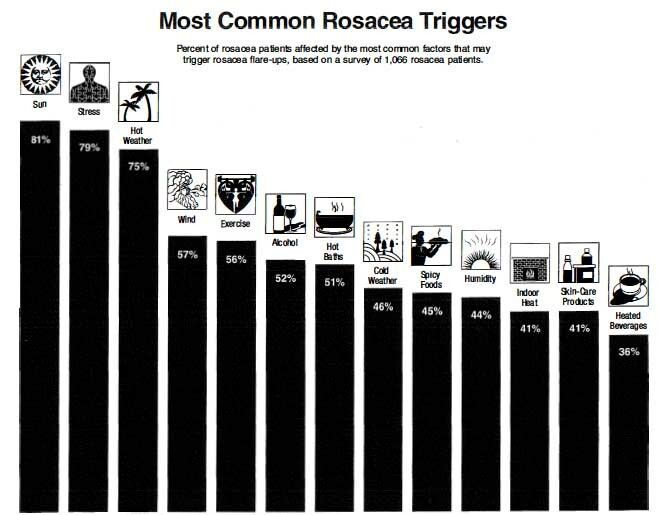 Percent of rosacea patients affected by the most common factors that may trigger rosacea flare-ups, based on a survey of 1,066 rosacea patients. Newer research indicates that this condition may be caused by an immune disorder or response with the substance cathelicidin as a trigger. Individuals with rosacea have higher levels of cathelicidin. More research is needed to fully understand the role this substance may have in triggering skin inflammation. The diagnosis of this condition is often made from the typical facial skin redness and symptoms such as easy blushing or flushing. However, it is usually under-diagnosed and many people are not aware they have the condition, especially when facial redness is transient. Dermatologists are specially trained to diagnose rosacea. No specific tests are required except in some cases when a skin biopsy or skin scraping can help identify the presence of mites or bacteria on the skin. Blood tests are not required except when they are used to help exclude other possible causes of facial flushing such assystemic lupus, dermatomyositis, or other autoimmune conditions. 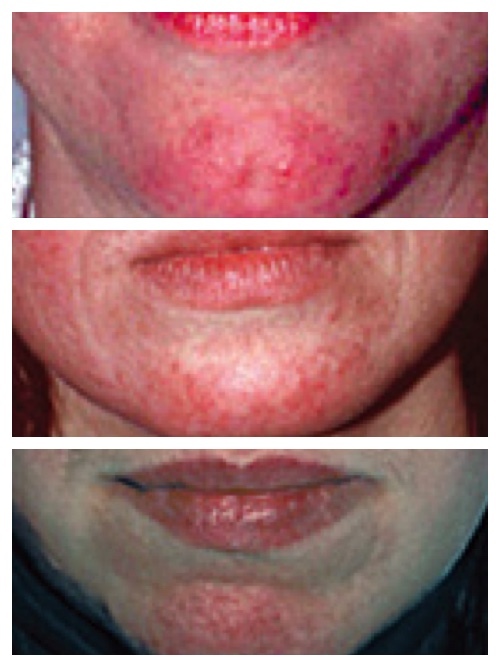 Erythematotelanglectatic Rosacea Chin Symptoms from Mild Rosacea Picture (bottom) to Severe (top). It also has many symptoms and dermatologists have classified the condition into four subtypes. People can have one or more subtypes and treatment varies with these. The first type is marked by frequent flushing, mostly at the center of the face, including the forehead, cheeks, nose, and chin. One may experience slight swelling and a burning feeling. Red blood vessels are visible under the skin. The second type is characterized by acne-like breakouts, frequently where the skin is quite red. People with this type have oily skin, which is very sensitive. The third type is rather rare, where the skin begins to thicken around the nose, chin, forehead, cheeks, and ears. The skin is oily and has a bumpy texture. 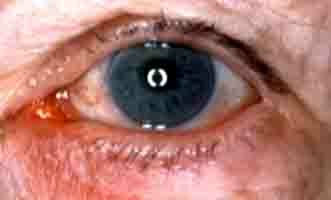 The last type involves the eyes, which appear watery or bloodshot, feeling gritty, burning, stinging, and itchy. The eyes may be very sensitive to light and very dry. Vision may be blurred. The condition can be dangerous to eyesight in some cases and should be treated aggressively by a Dermatologist. Aside from these, flare-ups can cause frustration, embarrassment, anxiety, and low self-esteem. While allergies are unlikely to be the cause of Rosacea, if you are sensitized to an allergen it can trigger a Rosacea flare-up. Dr. Doris Day talks about Rosacea, what triggers it, and some great treatment options. There is no cure for rosacea. You can control the symptoms. See a Dermatologist for the required prescription medications such as topicals and oral antibiotics. Wash the face with a gentle soap. Do not use harsh scrubbing brushes. Avoid pulling and tugging on skin. Apply moisturizer and allow to dry before applying prescription medications and then put on a broad spectrum sunscreen. Look for a sunscreen containing Zinc or Titanium Oxide. Also look for sunscreens marketed to babies. Mild skin flushing may not need any treatment if the individual is not bothered by it. However, for people who have oily skin with acne-like eruptions and thickened skin, a combination of treatments may be necessary, including facial washes, antibacterial creams, sunscreen protection, topical steroids, glycolic peels, and tretinoin preparations. In severe cases, oral antibiotics may be prescribed.Topicals include Metronidazol gel .75%, 2x daily (Metro Gel), Metronidazole cream 1x daily, Sodium sulfacetamide and topical antibiotics. The prescription topical Finacea (azelaic acid) combined with Metro Gel is a popular and effective approach for controlling mild rosacea. A new product, RhofadeTM has reduced persistent facial redness due to rosacea in 12% to 18% of adults all day, through 12 hours on day 29. There is a risk of rebound redness after you stop using the product. There is also an oral medication called Oracea® which can help to control Rosacea. I am currently trying a new topical, SoolantraTM instead of the Metronidazole/Finacea combination. So far so good after about 1 year of use. A specific antibiotic can help some people. This is not for the antibiotic properties but for the anti-inflammatory properties. Antibiotics applied to the skin have no risk to antibiotic resistance. Oral antibiotics have a minimal risk so their use is usually during limited time periods. Some dermatologists also recommend laser and intense pulsed light therapy, photodynamic therapy, electrocautery, and dermabrasion. Reducing alcohol consumption helps in some patients. Do not use acne medications to treat this condition since many can irritate the sensitive skin found in patients. If a skin care product burns or stings the skin do not use it. Treatment will start to work in 3 to 4 weeks. Bigger improvement is seen in 2 to 3 months. Rosacea patients should establish a daily skin care routine that works to gently clean and protect the face. After washing the face using any of the above, apply prescription medications and allow them to dry. Wash your hands after using prescription topicals. Next, apply a high SPF moisturizer for sun protection and skin care. There are over the counter Rosacea Creams that help to reduce skin inflammation and improve appearance. One product made specifically to help rosacea patients is Revitol Rosacea Cream. The product is formulated to reduce the appearance of redness and visible blood vessels, and it diminishes the appearance of bumps and pimples. Revitolin particular offers a money back guarantee, so there is no risk to determine if it will work in your particular case. Click here to learn more about the ingredients. Use brushes instead of sponges when applying makeup. Always choose rosacea based skin care products and use a mineral based foundation to cover-up any redness. Avoid pinks and reds and instead, use bronze or peach in order to call less attention to any redness. Avoid trigger foods and when cooking, use clean fats such as extra virgin olive oil or extra virgin coconut oil. Although there is no cure for this condition, various skin treatments can help reduce its symptoms during flare-ups and prevent them from getting worse. After several years the condition can disappear on its own, although in most patients it is a lifelong problem. The disorder subsides in some women after menopause. Some people find dilated blood vessels in the face after treatment. These are treated with a Pulse Laser in a Doctor's office. Have Some Rosacea Tips To Share? Do you have some advice or tips on how to control Rosacea flare-ups? If you do, please share it and help others.